In the State of Maryland, it is not uncommon for a Police Officer to charge a driver with both Driving under the influence of Alcohol (DUI) but also variations of that charge which include Driving while Impaired by Alcohol, Drugs or a combination of Alcohol and Drugs (DWI) . For all practical purposes, you are only at risk of being held responsible for one of traffic offenses no matter how many different ways you are charged. The reason the Police charge several different ways is to maximize the chance of convicting you of at least one of the offenses. It also provides some ability for your lawyer to plea bargain for a lesser offense if certain defenses can be applied. Although the possibility of jail time is usually reserved for the repeat offender or more serious case that may involve extreme speed, recklessness or an automobile accident, the maximum penalty for a DUI in Maryland is one (1) year of incarceration and/or a $1,000.00 fine. For a DWI, it is a maximum of 60 days of incarceration and/or a $500.00 fine. These penalties can be enhanced for repeat and/or subsequent offenders for the same offense. In addition to these penalties, you would be subject to 12 points on your license for a DUI conviction and 8 points on your license for a DWI conviction. For first time cases, however, there is the possibility of the Court not giving you the conviction and points if certain conditions are fulfilled. For a first time offender in a basic case, there is only minimum chance of receiving jail time. But if you receive the points, your license can be revoked and/or suspended for a considerable period of time so proper representation is essential to ensure that result does not occur. What are the Motor Vehicle Administration (MVA) Penalties before going to Court? Irrespective of whether you are convicted in Court of an alcohol or drug related traffic offense, the MVA has the right to penalize your license in certain situations. For example, if you voluntarily take a breath test and the results are a .08 BAC, you would be subject to a 180 day license suspension. If you refuse to take a breath test, your license would be subject to a 270 day suspension. As you may already have experienced, the Police Officer likely took your plastic Maryland license after you were charged with these traffic offenses and issued you a temporary paper license which was good for 45 days. Technically, a Police officer should not confiscate another States license but you would still be subject to the same suspension penalties in the State of Maryland. Rarely do these suspensions transfer to your home state. You do have the right to try and contest these suspensions by requesting and paying for a MVA Hearing. Although granted 30 days to make such a request from the date of your arrest or charge, it is best to do so within 10 days which would ensure your ability to drive up and until the date of the hearing. If your hearing request is received in that time period, then the MVA will mail you a paper license extension. The other alternative is to decide to take a standing MVA offer to have a breath machine called an Interlock installed in your vehicle for a period of time which usually equals or exceeds the license suspension that could be imposed. If you have this device installed, then your drivers privileges remain intake as long as you only drive a vehicle with that device. It is important that no one else drives this vehicle for if there is a violation of the Interlock, you would most likely be held responsible and then you might have to serve the entire suspension over again with no driving privileges. All of this information and more should be included in the paperwork that the Police officer gave you after your arrest. If unclear, you should immediately review this information with a competent lawyer from our Office to ensure that you understand your options and can make the best decision. These matters can be more complicated then they seem and often there is no second chance to accomplish a favorable result. DWI, the lesser of the two types of “drunk driving” related charges, carries a maximum penalty of 60 days. It is unwise to face any of these serious traffic offenses and/or MVA suspensions without the advice of a competent and experienced attorney. Waiting on securing qualified legal representation could lead to a wavier of your constitutional rights and/or driving privileges. If your vehicle is stopped and/or you are approached by a Police Officer after an automobile accident, it is best not to answer any questions at all as you may not fully understand if you were not at fault or you have not had any alcohol to drink or consumed any drugs or medication within for several hours at a minimum. If a Police officer suspects and/or smells alcohol or drugs, they will go into their "arrest mode" and will begin to collect any and all evidence to support that arrest and hoped for eventual convcition for the charges that they will eventually issue to you. This is in response to their standard training and procedures. Being charged might be inevitable even if you are polite but it is usually the best strategy not to cooperate with the Police Officers investigation even if that seems rude. You may not realize it, but the Police Officer may have already concluded that you are at fault in the accident and/or are impaired or under the influence of alcohol or drugs and are just collecting information from you to help them convict you - that is rude as well. Most drivers believe that a Police Officer in society is there to protect them. That would be correct if you are a "victim" but not if you are viewed as a "perpetrator of a traffic charge or crime. A Police Officer may gladly take a bullet to protect a "Victim" but may give a bullet to a perpetrator. But always be polite making no worrisome comments or actions. Police are trained to believe that everyone could be a potentially dangerous person so you do not need to give them concern even if they will be annoyed that you are asserting your constitutional rights not to discuss a particular subject with them. The Police usually understand your Constitutional rights but are hopeful that you do not. 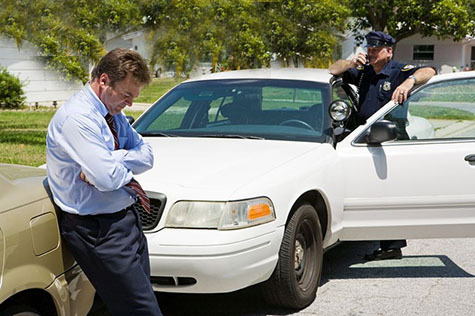 A Police officer will usually approach you in a friendly manner but that could change quickly once it is understood that you are not going to cooperate with them by refusing to answer their questions or being willing to perform what is almost impossible and awkward physical tests for which you will be severely judged for any mistake. Police officers are trained to view the glass as always half empty when it comes to subjective determinations such as your ability to perform physical tests to test your physical motor skills and/or coordination no matter how bizarre and unnatural these tests may be to most people. And those determinations will be used against you in Court in an effort to prove you guilty of impaired and/or under the influence driving. Despite what may be asserted, Police Officers only request that you perform FST's if they suspect that you are illegally under the influence of alcohol and/o drugs (illegal or prescriptions). If that occurs, you are likely to be arrested and charged whether you agree to do these FST's or not. As these tests would be difficult even in a perfect setting and nearly impossible on the side of the road with other vehicles passing by, street and Police vehicles lights among other distractions. It is usually best to refuse these tests as it is unlikely that you will ever do them to a Police Officers satisfaction especially if you have been drinking as there are no drivers license penalties involved for refusal of these FST and/or physical tests. Please understand, however, that the Police Officer will be aggravated by such a refusal for you are not playing by their rules and procedures to collect information against you to ensure a possible conviction. These tests are part of a Police Officers training and it would provide a strong basis for establishing their right to arrest and eventually convict you. At this point, the Officer may turn from friendly to confrontational - good cop to bad cop. You may be asked to take what is called a Preliminary Breath Test or PBT in addition to or in place of the FST's. There is some safety in taking the PBT for the results cannot be used by the Government to try and convict you at a trial though you have the right under Maryland Law to do so if you and your lawyer believed it would benefit your defense. Although it is usually Police procedure not to advise you of the number, if you are not arrested or charged, then you know you were likely under the legal standard or at worse borderline and a considerate Police Officer has decided not to ruin your day. If you are arrested, then you will know that the number was over the legal standard but the exact number will remain a mystery until you eventually get a copy of the Police Report or you decide to take the official breath test at the Police Station. When a breath sample is provided by a driver, the testing or breathalyzer machine computes the alcohol in your blood by comparing the alcohol that is routinely transferred from your blood to your lungs during normal respiration. It is not a perfect system as the machine is calibrated for an average person and each individual driver's physical ability to assimilate alcohol in their body could be different. In addition to a breath test, the Police Officer will use the results of any Field Sobriety Tests (FST) that the driver voluntarily attempted as evidence against you in Court. These usually include an eye test called Horizontal Gaze Nystagmus (HGN), Walk and Turn and the one Leg Stand along with other observations such as eyes, breath, speech, attitude, balance, coordination, etc. In general, The 4th and 5th Amendments to the United States Constitution grants the right for each person to refuse to respond to questions, incriminate themselves or provide consent to the Government to search themselves or their property without consent. Do not give up these rights even if you believe that you have not done anything wrong. Remember that a Police Officer will not be overjoyed with your unwillingness to assist them in collecting evidence against you. It is always best practice to be polite but not necessarily cooperative as they do carry weapons. The decision to take or refuse a breath test is a difficult one. In a State that you have to drive in for work or personal matters, a refusal may cause the imposition of a longer suspension period on your driver's license then if you actually took a breath test. But for other States, those ramifications usually will not apply. Remember that the FST's can do as much harm to your defense as a breath test so best to refuse both if you believe that the evidence collected will prove to be detrimental to your defense. The breath test is usually the only test that may cause suspension to your driver's license. there is no penalty in Maryland for refusing to attempt what are considered very difficult physical tests. But there are license suspensions for breath tests over .08 BAC and refusals to take those breath tests. Whether or not you take a breath test, it is always a good strategy to immediately seek a qualified medical facility to take a sample of your blood. A blood test is the best way to accurately determine your true BAC level. Such a test could be used in your defense in your Court case.